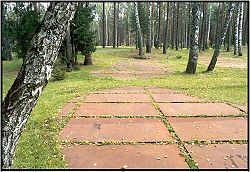 Mass graves at Katyn war cemetery. The Katyn massacre, also known as the Katyn Forest Massacre, was a mass execution of Polish citizens by the order of Soviet authorities in 1940. The massacre is of note for a number of reasons, but primarily due to the struggle over the attribution of culpability for several decades afterwards. The slaughter took place during the period of the Molotov-Ribbentrop Pact in which the Soviets allied themselves with Nazi Germany. This pact, named after the foreign ministers of the two governments, essentially divided up Eastern Europe between the two powers. In the section of Poland controlled by the Soviets, over 22,000 Polish officers and civilians were assassinated and buried in mass graves. Shortly thereafter, the Nazis violated the agreement and invaded the Soviet Union. Upon discovery of the graves, the crime was originally attributed to the Nazis. At that time, the Soviets were fighting on the side of the Allied forces, who had no interest in alienating their military ally. Estimates of the number of Polish citizens executed at three mass murder sites in the spring of 1940 range from some 14,540 through 21,857 to 28,000. Most of those killed were reserve officers taken prisoner during the 1939 Polish September Campaign, but the dead also included many civilians who had been arrested for being "intelligence agents and gendarmes, spies and saboteurs, former landowners, factory owners, and officials." Since Poland's conscription system required every un-exempted university graduate to become a reserve officer, the Soviets were thus able to round up much of the Polish, Jewish, Ukrainian, Georgian, and Belarusian intelligentsias of Polish citizenship. The term "Katyn Massacre" originally referred to the massacre at Katyn Forest near the village of Gnezdovo, near Smolensk, Russia, of Polish military officers confined at the Kozelsk prisoner of war camp. The term subsequently came to be applied also to the execution of prisoners of war held at Starobelsk and Ostashkov camps, and political prisoners in West Belarus and West Ukraine. All were shot, on Stalin's orders, at Katyn Forest, at the NKVD (Narodny Kommisariat Vnutrennikh Del or Secret Police) Smolensk headquarters, or at an abattoir in that same city, or at prisons in Kalinin (Tver), Kharkiv, Moscow, and other Soviet cities. 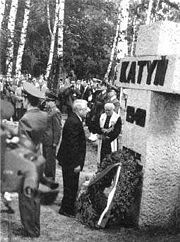 The 1943 German discovery of mass graves at Katyn Forest after German armed forces had occupied the site in 1941, precipitated a 1943 rupture of diplomatic relations between the Soviet Union and the Polish government-in-exile in London. The Soviet Union continued to deny responsibility for the massacres until 1990, when it acknowledged that the NKVD had in fact committed the massacres of over 22, 000 Polish soldiers and intelligentsia and the subsequent cover-up. The Russian government has admitted Soviet responsibility for the massacres, although it does not classify them as a war crime or an act of genocide, as this would have necessitated the prosecution of surviving perpetrators, which is what the Polish government has requested. Some, however, continue to believe the official version maintained by the Soviet government until 1989, claiming that it had been the Germans who had killed the Poles after invading the Soviet Union in mid-1941. 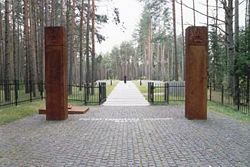 Main gate to Katyn war cemetery. Between 250,000 and 454,700 Polish soldiers had become prisoners and were interned by the Soviets, following their invasion of Poland, on September 17, 1939, three weeks after Germany and the Soviet Union had signed the secret Molotov-Ribbentrop Pact. This was a little over two weeks after the initial invasion of Poland, by Germany, on September 1, 1939. As early as September 19, 1939, the People's Commissar for Internal Affairs and First Rank Commissar of State Security, Lavrenty Beria, ordered the NKVD to create a Directorate for Prisoners of War (or USSR NKVD Board for Prisoners of War and Internees) headed by State Security Captain Pyotr K. Soprunenko to manage Polish prisoners. The NKVD took custody of Polish prisoners from the Red Army, and proceeded to organize a network of reception centers and transfer camps and arrange rail transport to prisoner of war camps in the western U.S.S.R. The camps were located at Jukhnovo (Babynino rail station), Yuzhe (Talitsy), Kozelsk, Kozelshchyna, Oranki, Ostashkov (Stolbnyi Island on Seliger Lake near Ostashkov), Tyotkino rail station (near Putyvl), Starobielsk, Vologda (Zaenikevo rail station), and Gryazovets. Kozelsk and Starobielsk were used mainly for military officers, while Ostashkov was used mainly for ZHP (Boy Scouts), gendarmes, police officers, and prison officers. Contrary to a widespread misconception, prisoners at these camps did include Polish intelligentsia. The approximate distribution of men at the camps was as follows: Kozelsk, 5,000; Ostashkov, 6,570; and Starobelsk, 4,000. They totaled 15,570 men. Contours of mass graves, fashioned from limestone tablets; symbolic gravestones. Once at the camps, from October 1939 to February 1940, the Poles were subjected to lengthy interrogations and constant political agitation by NKVD officers such as Vasily Zarubin. The Poles were encouraged to believe they would be released, but the interviews were in effect a selection process to determine who would live and who would die. According to NKVD reports, the prisoners could not be induced to adopt a pro-Soviet attitude. They were declared "hardened and uncompromising enemies of Soviet authority." On March 5, 1940, pursuant to a note to Joseph Stalin from Lavrenty Beria, the members of the Soviet Politburo—Stalin, Vyacheslav Molotov, Lazar Kaganovich, Mikhail Kalinin, Kliment Voroshilo, Anastas Mikoyan, and Beria—signed an order to execute 25,700 Polish "nationalists and counter-revolutionaries" kept at camps and prisons in occupied western Ukraine and Belarus. Aerial photo (October 13, 1943). Center (circled): mass graves. Top: Smolensk-Vitebsk highway. Bottom: NKVD dacha (circled); below it, Dnieper River. In the period from April 3 to May 19, 1940, about 22,000 prisoners were executed: 14,700-15,570 from the three camps and about 11,000 prisoners in western parts of Belarus and Ukraine. A 1956 memo from KGB Chief Alexander Shelepin to First Secretary Nikita Khrushchev confirmed 21,257 of these killings at the following sites: Katyn, 4,421; Starobelsk Camp, 3,820; Ostashkov Camp, 6,311; other places of detention, 7,305. Those who died at Katyn included one admiral, two generals, 24 colonels, 79 lieutenant colonels, 258 majors, 654 captains, 17 naval captains, 3,420 NCOs, seven chaplains, three landowners, one prince, 43 officials, 85 privates, and 131 refugees. Also among the dead were 20 university professors (including Stefan Kaczmarz), three hundred physicians, several hundred lawyers, engineers, and teachers, more than one hundred writers and journalists, as well as about two hundred pilots. In all, the NKVD eliminated almost half the Polish officer corps. Altogether during the massacre, the NKVD murdered 14 Polish generals: Leon Billewicz (ret. ), Bronisław Bohatyrewicz (ret. ), Xawery Czernicki (admiral), Stanisław Haller (ret. ), Aleksander Kowalewski (ret. ), Henryk Minkiewicz (ret. ), Kazimierz Orlik-Łukoski, Konstanty Plisowski (ret. ), Rudolf Prich (murdered in Lwów), Franciszek Sikorski (ret. ), Leonard Skierski (ret. ), Piotr Skuratowicz, Mieczysław Smorawiński, and Alojzy Wir-Konas (promoted posthumously). A mere 395 prisoners were saved from the slaughter, among them Stanisław Swianiewicz. They were taken to the Yukhnov camp and then to Gryazovets. They were the only ones who escaped death. 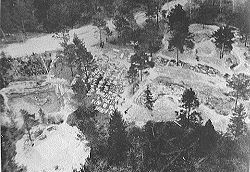 Aerial photo of mass graves during April 1943 German exhumations. Up to 99 percent of the remaining prisoners were subsequently murdered. People from Kozelsk were murdered in the usual mass murder site of Smolensk country, called Katyn Forest, people from Starobielsk were murdered in the inner NKVD prison of Kharkov and the bodies were buried near Pyatikhatki, and police officers from Ostashkov were murdered in the inner NKVD prison of Kalinin (Tver) and buried in Miednoje . Polish currency and military insignia from the mass graves. Detailed information on the executions in Kalinin NKVD prison was given during the hearing of Dmitrii S. Tokarev, former head of the Board of the District NKVD in Kalinin. According to Tokarev, the shooting started in the evening and ended at dawn. The first transport on April 4, 1940, carried 390 people, and the executioners had a hard time killing so many people during one night. The following transports were no greater than 250 people. The executions were usually performed with German made Walther-type pistols supplied by Moscow. Evidence suggests that the killings were methodical. After the condemned's personal information was checked, he was then handcuffed and led to a cell insulated with a felt-lined door. The sounds of the murders were also masked by the operation of loud machines (perhaps fans) throughout the night. After being taken into the cell, the victim was immediately shot in the back of the head. His body was then taken out through the opposite door and laid in one of the five or six waiting trucks, whereupon the next condemned was taken inside. The procedure went on every night, except for the May Day holiday. Near Smolensk, the Poles, with their hands tied behind their backs, were led to the graves and shot in the neck. The question of the Polish prisoners' fate was first raised soon after the Germans invaded the Soviet Union in June 1941, when the Polish government-in-exile and the Soviet government signed the Sikorski-Mayski Agreement in which they agreed to cooperate against Germany. They also agreed that a Polish army was to be formed on Soviet territory. When the Polish general Władysław Anders began organizing this army, he requested information about the Polish officers. During a personal meeting, Stalin assured him and Władysław Sikorski, the Prime Minister of the Polish government-in-exile, that all the Poles had been freed, though some of them may have escaped to Manchuria for example. The fate of the missing prisoners remained unknown until April 1943 when the German Wehrmacht discovered the mass grave of more than four thousand Polish military reserve officers in the forest on Goat Hill near Katyn. Dr. Joseph Goebbels saw this discovery as an excellent tool to drive a wedge between Poland, Western Allies, and the Soviet Union. On April 13 Berlin Radio broadcast to the world that the German military forces in the Katyn forest near Smolensk had uncovered "a ditch ... 28 meters long and 16 meters wide, in which the bodies of three thousand Polish officers were piled up in 12 layers." The broadcast went on to charge the Soviets with carrying out the massacre in 1940. We are now using the discovery of twelve thousand Polish officers, murdered by the Gosudarstvenie Politicheskie Upravlenie (or State Political Directorate (GPU)) for anti-Bolshevik propaganda on a grand style. We sent neutral journalists and Polish intellectuals to the spot where they were found. Their reports now reaching us from ahead are gruesome. The Fuehrer has also given permission for us to hand out a drastic news item to the German press. I gave instructions to make the widest possible use of the propaganda material. We shall be able to live on it for a couple weeks. The Germans had succeeded in discrediting the Soviet Government in the eyes of the world and briefly raised the specter of a communist monster rampaging across the territories of western civilization; moreover they had forged the unwilling General Sikorski into a tool which could threaten to unravel the alliance between the Western Allies and Soviet Union. 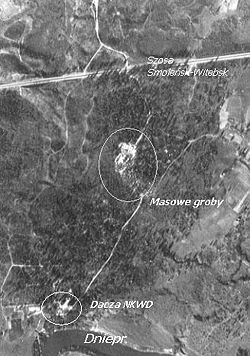 The Soviet government immediately denied the German charges and claimed that the Polish prisoners of war had been engaged in construction work west of Smolensk and consequently were captured and executed by invading German units in August 1941. The Soviet response on April 15 to the German initial broadcast of April 13, prepared by the Soviet Information Bureau stated that "Polish prisoners of war who in 1941 were engaged in construction work west of Smolensk and who…fell into the hands of the German-Fascist hangmen…"
The Allies were aware that the Nazis had found a mass grave as the discovery transpired via radio transmissions intercepted and decrypted by Bletchley Park. Germans and the international commission, which was invited by Germany, investigated the Katyn corpses and soon produced physical evidence that the massacre took place in early 1940, at a time when the area was still under Soviet control. 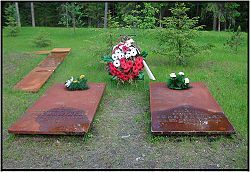 Graves of Generals Bronisław Bohatyrewicz (right) and Mieczysław Smorawiński, victims of the massacres. In April 1943 the Polish government in exile insisted on bringing this matter to the negotiation table with Soviets and also insisted that an investigation by the International Red Cross undertaken. Stalin then accused the Polish government in exile of collaborating with Nazi Germany, broke diplomatic relations with the Poles, and started a campaign to get the Western Allies to recognize the alternative Polish pro-Soviet government in Moscow led by Wanda Wasilewska. Sikorski, whose uncompromising stance on that issue was beginning to create a rift between the Western Allies and the Soviet Union, died suddenly two months later. The cause of his death is still disputed. Unfortunately we have had to give up Katyn. The Bolsheviks undoubtedly will soon 'find' that we shot twelve thousand Polish officers. That episode is one that is going to cause us quite a little trouble in the future. The Soviets are undoubtedly going to make it their business to discover as many mass graves as possible and then blame it on us. Having retaken the Katyn area almost immediately after the Red Army had recaptured Smolensk, the Soviet Union, led by the MKVD, began a cover-up. A cemetery the Germans had permitted the Polish Red Cross to build was destroyed and other evidence removed. In January 1944 the Soviet Union sent the "Special Commission for Determination and Investigation of the Shooting of Polish Prizoners of War by German-Fascist Invaders in Katyn Forest," (U.S.S.R. Spetsial'naya Kommissiya po Ustanovleniyu i Rassledovaniyu Obstoyatel'stv Rasstrela Nemetsko-Fashistskimi Zakhvatchikami v Katynskom) to investigate the incidents again. The so-called "Burdenko Commission," headed by Nikolai Burdenko, the President of the Academy of Medical Sciences of the U.S.S.R., exhumed the bodies again and reached the conclusion that the shooting was done in 1941, when the Katyn area was under German occupation. No foreign personnel, including the Polish communists, were allowed to join the “Burdenko Commission,” whereas the Nazi German investigation had allowed wider access to both international press and organizations (like the Red Cross) and even used Polish workers, like Józef Mackiewicz. The Western Allies had an implicit, if unwilling, hand in the cover-up in their endeavor not to antagonize their World War II ally. The resulting Polish-Soviet crisis was beginning to threaten the vital alliance with the Soviet Union at a time when the Poles' importance to the Allies, essential in the first years of the war, was beginning to fade. In a retrospective review of records, it is clear that both British Prime Minister Winston Churchill and U.S. President Franklin D. Roosevelt were increasingly torn between their commitments to their Polish ally, the uncompromising stance of Sikorski, and the demands by Stalin and his diplomats. 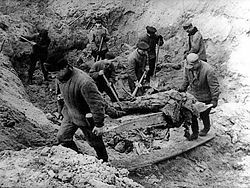 German exhumations of Polish dead at Katyn Forest (1943). In private, British Prime Minister Winston Churchill agreed that the atrocity was likely carried out by the Soviets. According to the note taken by Count Edward Raczyński, Churchill admitted on April 15 during a conversation with General Sikorski: "Alas, the German revelations are probably true. The Bolsheviks can be very cruel." However, on April 24, Churchill assured the Soviets: "We shall certainly oppose vigorously any 'investigation' by the International Red Cross or any other body in any territory under German authority. Such investigations would be a fraud and its conclusions reached by terrorism." Unofficial or classified UK documents concluded that Soviet guilt was a "near certainty," but the alliance with the Soviet was deemed to be more important and the official version supported the Soviet one, censoring the contradictory accounts. Churchill's own post-war account of the Katyn affair is brief. In his memoirs, he quotes the 1944 Soviet inquiry into the massacre, which predictably proved that the Germans had committed the crime, and adds, "belief seems an act of faith." In America, a similar response was adopted, despite the production of two official intelligence reports into Katyn massacre that contradicted the official position. In 1944 Roosevelt assigned Army Captain George Earle, his special emissary to the Balkans, to compile information on Katyn, which he did using contacts in Bulgaria and Romania. He concluded that the Soviet Union committed the massacre. After consulting with Elmer Davis, the director of the Office of War Information, Roosevelt rejected that conclusion, saying that he was convinced of Nazi Germany's responsibility, and ordered Earle's report suppressed. When Earle formally requested permission to publish his findings, the President gave him a written order to desist. Earle was reassigned and spent the rest of the war in American Samoa. Largest of the Katyn mass graves. A further report in 1945 supporting Earle’s conclusion was produced and stifled. In 1943 two U.S. prisoner of war, Lt. Col. Donald B. Stewart and Col. John H. Van Vliet, had been taken by Nazi Germans to Katyn in 1943 for an international news conference. Later, in 1945, Van Vliet wrote a report concluding that the Soviets, not the Germans, were responsible. He gave the report to Maj. Gen. Clayton Bissell, Gen. George Marshall's assistant chief of staff for intelligence, who destroyed it. During the 1951–1952 investigation, Bissell defended his action before Congress, contending that it was not in the U.S. interest to embarrass an ally whose forces were still needed to defeat Japan. In November 1945 seven officers of the German Wehrmacht, K.H. Strueffling, H. Remlinger, E. Böhom, E. Sommerfeld, H. Jannike, E. Skotki, and E. Geherer were tried by a Soviet court. They were falsely charged and condemned to death for their role in the Katyn massacre and were subsequently hanged. Three more were tried on the same charges; E.P. Vogel, F. Wiese, and A. Diere. They received sentences of 20 years of hard labor, were turned over to the Soviets, and were never heard from again. 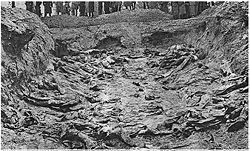 In 1946, the chief Soviet prosecutor at the Nuremberg Trials, Roman A. Rudenko, tried to indict Germany for the Katyn killings, stating that "one of the most important criminal acts for which the major war criminals are responsible was the mass execution of Polish prisoners of war shot in the Katyn forest near Smolensk by the German fascist invaders," but dropped the matter after the United States and the United Kingdom refused to support it and after German lawyers had mounted an embarrassing defense. In 1951–1952, in the background of the Korean War, a U.S. Congressional investigation chaired by Rep. Ray J. Madden and known as the Madden Committee investigated the Katyn massacre. It charged that the Poles had been killed by the Soviets and recommended that the Soviets be tried before the International World Court of Justice. The committee was, however, less conclusive on the issue of alleged American cover-up. The question of responsibility remained controversial in the West as well as behind the Iron Curtain. For example, in the United Kingdom, in the late 1970s, plans for a memorial to the victims bearing the date 1940 (rather than 1941) were condemned as provocative in the political climate of the Cold War. In Poland, Communist authorities covered up the matter in concord with Soviet propaganda, deliberately censoring any sources that might shed some light on the Soviet crime. Katyn was a forbidden topic in postwar Poland. Katyn became erased from Poland's official history, but it could not be erased from historical memory. In 1981, Polish trade union Solidarity erected a memorial with the simple inscription "Katyn, 1940" but it was confiscated by the police, to be replaced with an official monument "To the Polish soldiers—victims of Hitlerite fascism—reposing in the soil of Katyn." Nevertheless, every year on Zaduszki feast similar memorial crosses were erected at Powązki cemetery and numerous other places in Poland, only to be dismantled by the police overnight. The Katyn subject remained a political taboo in Poland until the fall of communism in 1989. After the late 1980s, pressure was put not only on the Polish government, but on the Soviet one as well. Polish academics tried to include Katyn in the agenda of the 1987 joint Polish-Soviet commission to investigate censored episodes of the Polish-Russian history. In 1989 Soviet scholars revealed that Joseph Stalin had indeed ordered the massacre, and in 1990 Mikhail Gorbachev admitted that the NKVD had executed the Poles and confirmed two other burial sites similar to the site at Katyn: Mednoje and Pyatikhatki. His remarks were given extensive coverage on Soviet television. At the ceremony he placed a bouquet of red roses bearing a handwritten message penned in both Polish and English: "For the victims of Stalin and the NKVD. Zbigniew Brzezinski." 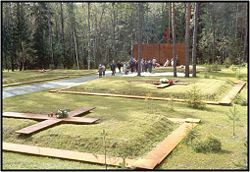 On April 13, 1990, the 47 anniversary of the discovery of the mass graves, the U.S.S.R. formally expressed "profound regret" and admitted Soviet secret police responsibility. That day is also the International Day of Katyn Victims Memorial (Światowy Dzień Pamięci Ofiar Katynia). В. Yeltsin in Katyn, 1993. The investigations that indicted the German state rather than the Soviet state for the killings are sometimes used to impeach the Nuremberg Trials in their entirety, often in support of Holocaust denial, or to question the legitimacy and wisdom of using the criminal law to prohibit Holocaust denial. Still, there are some who deny Soviet guilt, call the released documents fakes, and try to prove that Poles were shot by Germans in 1941. On the opposing sides there are allegations that the massacre was part of wider action coordinated by Nazi Germany and Soviet Union, or that Germans at least knew of the massacre beforehand. The reason for these allegations is that Soviet Union and Nazi Germany added a secret supplementary protocol on September 28 to the German-Soviet Boundary and Friendship Treaty, in which they stated that “Both parties will tolerate in their territories no Polish agitation which affects the territories of the other party. They will suppress in their territories all beginnings of such agitation and inform each other concerning suitable measures for this purpose,” after which in 1939–1940 a series of conferences by NKVD and Gestapo were organized in the town of Zakopane. The aim of these conferences was to coordinate the killing and the deportation policy and exchange experience. A University of Cambridge professor of history, George Watson, believes that the fate of Polish prisoners was discussed at the conference. This theory surfaced in Polish media, and also points out that a similar massacre of Polish elites (AB-Aktion) was taking place at the same time and with similar methods in German occupied Poland. On the 65th anniversary of the Katyn murder the Senate pays tribute to the murdered, best sons of the homeland and those who fought for the truth about the murder to come to light, also the Russians who fought for the truth, despite harassment and persecution." The resolution also stressed that the authorities of the Russian Federation "seek to diminish the burden of this crime by refusing to acknowledge it was genocide and refuse to give access to the records of the investigation into the issue, making it difficult to determine the whole truth about the murder and its perpetrators." Russia and Poland remained divided on the legal qualification of the Katyn crime, with the Poles considering it a case of genocide and demanding further investigations, as well as complete disclosure of Soviet documents, and the Russians rejecting that view and considering the matter closed. The massacre is featured in Robert Harris's WWII thriller Enigma. Stalin signed the Katyn death orders on March 5, 1940, and he died exactly 13 years to the date in 1953. ↑ Fischer, Benjamin B., The Katyn Controversy: Stalin's Killing Field Retrieved June 7, 2007. ↑ Zawodny, Janusz K., Death in the Forest: The Story of the Katyn Forest Massacre. (University of Notre Dame, 1962) ISBN 0268008493; Zawodny, Janusz K., In the Forest: The Story of the Katyn Forest Massacre. Retrieved June 7, 2007; Electronic Museum, Excerpt from the minutes No. 13 of the Politburo of the Central Committee meeting. Retrieved June 7, 2007. ↑ Institute of National Remembrance, Decision to commence investigation into Katyn Massacre. Retrieved June 7, 2007. ↑ Dziennik Ustaw, Act of April 9, 1938, on Compulsory Military Duty. Retrieved June 7, 2007. ↑ Zawodny, Janusz K., In the Forest: The Story of the Katyn Forest Massacre. Retrieved June 7, 2007; Fischer, Benjamin B., The Katyn Controversy: Stalin's Killing Field Retrieved June 7, 2007; Institute of National Remembrance, Decision to commence investigation into Katyn Massacre. Retrieved June 7, 2007. ↑ BBC News, Russia to Release Massacre Files. Retrieved June 7, 2007. ↑ Encyklopedia PWN, KAMPANIA WRZEŚNIOWA 1939. Retrieved June 7, 2007. ↑ Fischer, Benjamin B., The Katyn Controversy: Stalin's Killing Field Retrieved June 7, 2007; Tucholski, Jędrzej, The grave unknown elsewhere or any time before ... Katyń–Kharkov–Mednoe Retrieved June 7, 2007. ↑ Tucholski, Jędrzej, The grave unknown elsewhere or any time before ... Katyń–Kharkov–Mednoe Retrieved June 7, 2007. ↑ Zawodny, Janusz K., In the Forest: The Story of the Katyn Forest Massacre. Retrieved June 7, 2007. ↑ A Katyn and World War II Diary of Leon Gladun, Polish Officer. Retrieved June 7, 2007; Fischer, Benjamin B., The Katyn Controversy: Stalin's Killing Field Retrieved June 7, 2007. ↑ Electronic Museum, Excerpt from the minutes No. 13 of the Politburo of the Central Committee meeting. Retrieved June 7, 2007. ↑ The Holocaust History Project, Noncombatant Deaths in WW II. Retrieved June 7, 2007. ↑ Institute of National Remembrance, Decision to commence investigation into Katyn Massacre. Retrieved June 7, 2007; Fischer, Benjamin B., The Katyn Controversy: Stalin's Killing Field Retrieved June 7, 2007. ↑ Tokariev, Dmitri Stepanovich, Ablokov, Anatoliy, and Zbiniewicz, Fryderyk, Zeznanie Tokariewa(Warsaw: Niezależny Komitet Historyczny Badania Zbrodni Katyńskiej, 1994); Gieysztor, Aleksander, Pikhoya, Rudolf Germanovich, Materski, Wojciech, and Belerska, Aleksandra ed., Katyń; dokumenty zbrodni (Warsaw: Trio, 1995). ↑ Paczkowski, Andrzej, The Spring Will Be Ours: Poland and the Poles from Occupation to Freedom, 2003 ISBN 0271023082; Kubit, Jozef Kazimierz, Was General Sikorski a victim of the Katyn massacre? Retrieved June 7, 2007. ↑ Fischer, Benjamin B., The Katyn Controversy: Stalin's Killing Field Retrieved June 7, 2007; Zawodny, Janusz K., Death in the Forest: The Story of the Katyn Forest Massacre. (University of Notre Dame, 1962) ISBN 0268008493; Mackiewicz, Józef, I saw it with my own eyes... Retrieved June 7, 2007. ↑ Fowler, Michael, "Winston S. Churchill: Philosopher and Statesman." (University Press of America, 1985) ISBN 0819144169; Fowler, Michael, Winston Churchill: Philosopher and Statesman. Retrieved June 8, 2007. ↑ The National Archives, Select Committee to Investigate and Study the Facts, Evidence, and Circumstances of the Katyn Forest Massacre (1951-52) Retrieved June 8, 2007; United States House of Representatives, Final Report of the Select Committee to Investigate and Study the Facts, Evidence, and Circumstances of the Katyn Forest Massacre (1951-52) Retrieved June 8, 2007. ↑ Electronic Museum, Lt. Col. John H. Van Vliet–Report of May 11, 1950.Retrieved June 8, 2007. ↑ Famira, H., Germans Hanged for Katyn Retrieved June 8, 2007; Lüftl, Walter, The Katyn-Lie: Truth Will Always Emerge—When the Liars are Removed from Power Retrieved June 8, 2007. ↑ The National Archives, Select Committee to Investigate and Study the Facts, Evidence, and Circumstances of the Katyn Forest Massacre (1951-52) Retrieved June 8, 2007. ↑ Yahoo News, Russia says WW2 executions of Poles not genocide. Retrieved June 8, 2007. ↑ "CHRONOLOGY 1990; The Soviet Union and Eastern Europe." Foreign Affairs, 1990. pp. 212. ↑ Encyklopedia PWN, Katyn Retrieved June 8, 2007; Fischer, Benjamin B., The Katyn Controversy: Stalin's Killing Field Retrieved June 7, 2007. ↑ Beria, Lvrenty, Beria's March 1940 Proposal. Retrieved June 8, 2007; Electronic Museum, Excerpt from the minutes No. 13 of the Politburo of the Central Committee meeting. Retrieved June 7, 2007; Shelepin, Aleksandr, Shelepin's March 3, 1959, Note Retrieved June 8, 2007. ↑ Права человека в России, Вечер "Катынь – боль не только Польши, но и России" Retrieved June 8, 2007. ↑ Glazov, Jamie, The Lies of Katyn Retrieved June 8, 2007; Stylinski, Andrzej, Russians still in Denial: Poles Reject Moscow's Statement Retrieved June 8, 2007. ↑ The Avalon Project at Yale Law School, Secret Supplementary Protocol. Retrieved June 8, 2007. ↑ Moor-Jankowski, Dr. Jan, Holocaust of Non-Jewish Poles During WWII. Retrieved June 8, 2007. ↑ Coatney, Louis Robert, The Katyn Massacre: An Assessment of its Significance as a Public and Historical Issue in the United States and Great Britain, 1940–1993. Retrieved June 8, 2007. ↑ RFE/RL, ...Despite Poland’s Status as 'Key Economic Partner' Retrieved June 8, 2007. 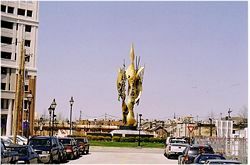 ↑ MEΓ, Длинная тень массового убийства Retrieved June 8, 2007. ↑ Luxmoore, Jonathan, Polish priest deplores Russian blocking of massacre enquiry. Retrieved June 8, 2007; Traynor, Ian, Russian victory festivities open old wounds in Europe Retrieved June 8, 2007; Boar of International Memorial Society, Statement: On Investigation of the “Katyn Crime” in Russia Retrieved June 8, 2007. ↑ The Warsaw Voice News, Katyn Resolution Adopted Retrieved June 8, 2007. ↑ The Embassy of the Republic of Poland in Canada, Senate pays tribute to Katyn victims Retrieved June 8, 2007. Jerzewski, Leopold. Dzieje sprawy Katynia. (History of the Katyn affair) Warszawa. 1980. Katyn Forrest Massacre. Books about the Katyn Forest Massacre Retrieved June 8, 2007. Moszyński, Adam. Lista katyńska. Jeńcy obozów Kozielsk–Ostaszków–Starobielsk zaginieni w Rosji Sowieckiej (Katyń list: Prisoners of Kozelsk–Ostaszków–Starobielsk Camps Who Disappeared in Soviet Russia), London. 1949. Zawodny, Janusz K. Katyń. Lublin. 1989. Nazi Photos of the 1943 Exhumations in Katyn Forest. This page was last modified on 14 April 2018, at 15:24.